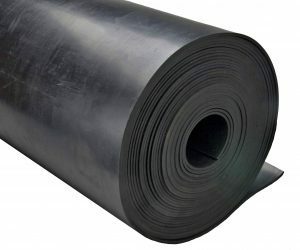 Diaphragm Sheet is a nylon-reinforced neoprene rubber sheet designed for applications requiring superior strength, with stretch and tear resistance. Neoprene offers moderate oil resistance. Nylon reinforcement increases the tensile strength for more rigorous applications. This material is available in 48 inch wide rolls standard, or cut to width (minimum may apply).